Welsh Corgi Cardigan is a middle sized, strong and powerful, highly intelligent breed. The body is longer than high. 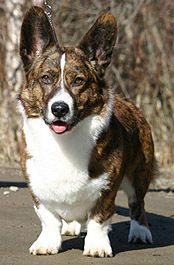 The watchwords are “long, low and level”, but despite of these “3L”, Cardigan Welsh Corgi should look like a normal strong dog with short legs. Cardigan Welsh Corgis are among the oldest of all herding breed, believed to have been existence in Wales for over 3 000 years. They were an excellent cattle driver and farm guard. Their low stature helped them role out of the way when a cow kicked. Due to this working heritage, Cardigan Welsh Corgis are still sturdy and agile and they need a lot of work – not only physical, but also mental work. Cardigan Welsh Corgis are known for their personality. If you need to describe this breed by using only one word, this word is definitely “clown”. They want to be involved with their family. They are full of fun and curiosity. Like most herding dogs, caring for their family comes naturally to the devoted, alerts and dependable Cardigan. They are good alarm barkers and sometimes they might even use their voice too much. The average lifespan of a Cardigan is around 12-15 years and the general health is quite good. Spinal disk problems, elbow dysplasia (ED), hip dysplasia (HD), progressive retinal atrophy (PRA) and cataracts are the most known health issues. If You want to study more about these diseases, go to CCI’s “Health issues” or to CWCCA’s “Cardigan Health“.